A machine taken out on a race track is often pushed to its limits, and one element that can have a serious impact on its performance is heat. In most cases, the rising cylinder head temperature can have a serious effect on the incoming air passing through the intake manifold. One method of fighting this problem is to sandwich a plate that minimizes heat transfer between the surge tank and the cylinder head. The Power Plate was designed to keep the intake temperatures low to keep up the torque and the power of the engine. Everyone should know the fact that the intake air temperatures of an engine greatly affects the power output. In forced induction applications such as turbocharged engines, a component called the intercooler is placed to keep down the intake air temperatures. For naturally aspirated engines, it gets a little trickier. Here, Zero 1000 engineered the Power Plate. The ingredients used to construct the Power Plate has a very low heat transfer rate, so when this component is placed between the surge tank and the cylinder head, it serves as a heat barrier. Basically, the heat coming off the cylinder head is prevented from transferring to the surge tank. By doing so, the power output of the engine remains at its full potential. Let's take a look at how well this item did on our tests. An EG6 with a B18C powerplant was used as our test vehicle. 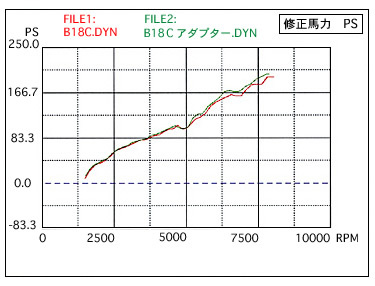 The oil temperature was at 80 degrees C, water temperature at 84 degree C, and the idle intake air temperature was measured at 50 degrees C according to the Power FC data logger. The vehicle was tested on a chassis dynamometer in 4th gear from 2500 rpms to 8000 rpms. The Power Plate is used in place of the stock gasket. Installation of this product requires draining and refilling the cooling system. An increase of 6.1 horsepower and 8.6 ft/lbs of torque increase was logged. The intake air temperature at the revolution limit was 2 degrees lower as well. With a 0.13 second faster revolution rate, this time may be an important factor when racing at a circuit. "I put a low retail price for this product so anyone can buy it. It's priced under 10,000 yen and various applications for Honda and Acura are available!"